Alter The Press! : Ed Sheeran Covers Beyoncé's "Drunk In Love"
Ed Sheeran Covers Beyoncé's "Drunk In Love"
Ed Sheeran appeared on Z100's Elvis Duran and the Morning Show early this morning (April 11th) and surprised listeners by performing a cover of Beyoncé's "Drunk In Love." You can watch a video of the singer/songwriter's stripped down rendition of the track below. 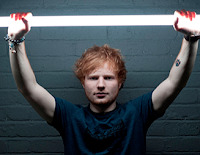 Don't forget, Ed's long-awaited new album X, will be released on June 23rd worldwide via Atlantic Records. Pre-order your copy today via iTunes. In case you missed it, you can listen to the first single from the album, "Sing," featuring Pharrell, here.